The central ski resort of the famous ski area in French Alps – Flaine – forces the heart to beat faster not only for the funs of winter sports. This untypical resort lies in the heart of Le Grand Massif ski area, and it also conquers the admirers of architecture and art. The secret hides in the fact that the skiing town was designed in 1960-s by the creators of the Pompidou Center Eric and Sylvie Boisson as a single architectural ensemble. Their main aim was to integrate the best modern ski base into the surrounding nature. And for accomplishing of that task, the well-known architect in the style of the Bauhaus, Marcel Breuer, proceeded with full responsibility. And as a result we have there the optimal combination of three parts of the city, located at different height levels, in harmony with the landscape of the high mountain valley. You sure have to see it! Along with the architectural sights, the center of the Flaine ski resort, with no cars at all, also offers real masterpiece of art in the form of sculptures by Picasso and Vasarely, as well as the Center d'Art, opened in 1969 - the center of contemporary art. The perfect harmony between modern comfort and nature is also reflected in everything related to winter sports. At an altitude of 1600m, Flaine offers direct access to a large selection of local trails and to the entire ski area of â€‹â€‹Le Grand Massif, including the panorama of Mont Blanc. It’s a truly majestic place. Flaine is located in the department of Haute Savoie. The village is small, the number of permanent residents is 150 people. Flaine is one of the five resorts of the united zone Grand Massif. 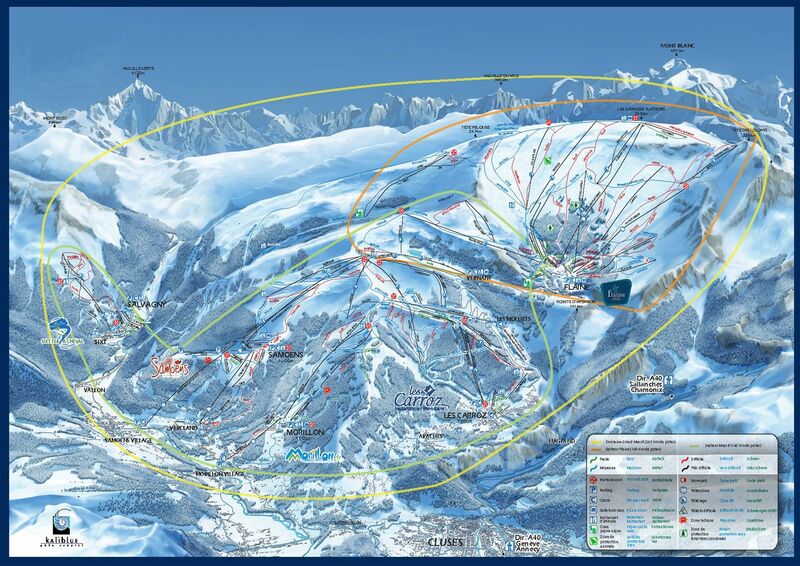 Located between altitudes of 1,600 metres and 2,500 metres, Flaine is the highest resort in the Grand Massif ski area. It is bordered by the Portes du Soleil ski area to the North, les Aravis ski area to the West and le Pays du Mont-Blanc to the South. Alps2Alps does everything to satisfy all the needs of our clients, even the most demanding. And travelling with our company, you can be sure – we do everything possible to keep our fares uniquely beneficial costs throughout the season. Anyway, you can be sure for 100% that your transfer quote will be as much profitable as possible. All our clients know that we never make our prices growing at any time or for any reason. Against that, in Alps2Alps we consider all the factors to make the transfer cost the most beneficial. And we always recommend to make a booking of our services in advance, in order to get the best offers. Be sure, that very significant discounts are waiting for you in a case of booking transfer services for off-peak and midweek transfers to Flaine (up to 60% discount than at weekends). Your transfer cost will also be dependant on vehicle availability and use of the vehicle, transfer schedule, road tolls and parking charges at the airport. If you want to ask some more things, please contact us directly and we will discuss your future trip. Flaine is the biggest ski resort in the all ski area of Grand Massif. From its main peak Grand Platieres (2480 m) it is quite easy to reach all the main trails of these large region. Flaine is a family place. During the French school holidays here is crowded and noisy. The resort offers the services of a kindergarten, a children's game club and a ski school. As a rule, after the skiing children have enough energy for fun. Every evening, the resort staff arranges fun for the little skiers, relay races, discos and games. Sure you want to avoid the prices growing before the eve of the peak season, don’t you? What’s why we always advise our clients to book their ski transfer in advance for paying the lowest possible price. If you still have some questions or you want to clarify any information (maybe you can’t find some resort or service in the list in our web page), don’t doubt to contact us. All you have to do is just give a call to our customer service support team, we are ready to help your in your request.